May 6, 2017 -- 11:00 a.m.
To show our support for the cycling community in DC, please join us for the second annual "Blessing of Bicycles" to be held as the Church of the Ascension and St. Agnes on Saturday, May 6, at 11am. Click here to register for this free event. The blessing is a short service in which our priest-in-charge, Father Dominique, will say a prayer over all the assembled bikes, asking for protection and joy for cyclists as they ride. While the service comes from the Anglican tradition, no religious affiliation is required! Blessings are a way that the Anglican church shows love and support for various groups so please allow us to bless you regardless of your stance on faith. The blessing will last just under 30 minutes and will be followed by a group bike ride. During the mingling time, we will be selling pizza, baked goods and drinks as well as t-shirts bearing the image of the Madonna de Ghisallo provided by Cycology Gear. All proceeds from this event will go towards making ASA more handicap accessible. Donations are also appreciated and accepted. Spoke cards and stickers will be provided to all participants free of charge. Legend has it that in medieval times, a local count was being attacked by bandits near the town of Ghisallo, Italy when he saw an apparition of the Virgin Mary, and running towards this vision saved him. Thus, the Madonna del Ghisallo became the patroness of travelers. Then, in 1949 a local priest managed to persuade Pope Pius XII to admit her as the patroness of cyclists. Since then, the small chapel has become a shrine to cycling legends, both living and deceased, and provides a memorial to those who have fallen in our sport. Being an almost permanent fixture on the percorso of the Giro di Lombardia – as well as featuring regularly in the course of the Giro d'Italia – has kept the chapel in the forefront of the cycling world over the years and a collection of cycling memorabilia that would be the envy of any museum has accumulated inside. The walls of the tiny chapel are almost covered in pennants of cycling clubs from all over the world, jerseys from champions of the recent and distant past, and most prominently, a selection of bikes that have made history. 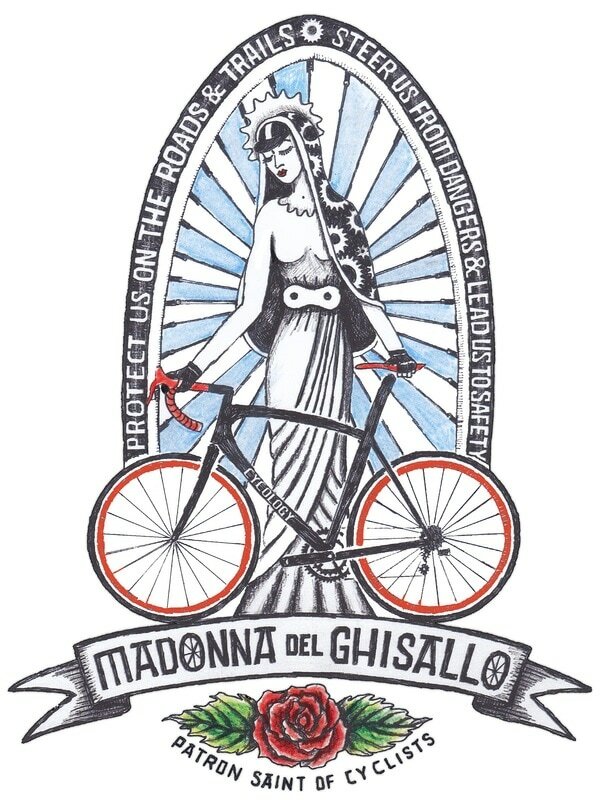 Our visual representation of the Madonna de Ghisallo comes from Cycology Gear, an Australian clothing company specializing in cycling-related clothing. They have graciously provided us the image of the Madonna to use free of charge which makes possible the spoke cards, stickers and t-shirts we'll have available at the event.